So a couple weeks ago fellow homebrewer and IronBrewer participant Scott Stroh (aka @corosis) threw down a public challenge of a mini IronBrewer. How could I say no to that? After a couple tweets back and forth it was on! A couple tweets after that we had roped a couple other homebrewers into our bacon challenge. With myself, Scott, Billy Broas (@billybroas), Joe Postma (@JoePostma), and Jamey Barlow (@BarlowBrewing) this is going to be a crazy tough brew with some seriously stiff competition! For this brew I actually decided to use bacon grease in the brown ale lending to it’s name, the Greasy Pig Brown Ale. The smell of the beer while in the boil was friggin’ amazing. My garage was overtaken by the ludicrous smell of fresh cooked bacon. I still haven’t decided if I’m got to “Dry Pork” the beer. (Stealing Jamey’s phrase). Going to try the beer again in two weeks to see if it needs more bacon before I carb it. We are all going to be tasting the beer in feb; so I have a couple more weeks for it to settle in the corney before I decide what to do. Now if you’ve been brewing beer for awhile, you’ll know that my main ingredient is the probably one of the worst things you can do to a beer. Oil, or in this case grease, will destroy a beer. It will kill the head retention and make the beer feel slick. Yet, I did it any way. 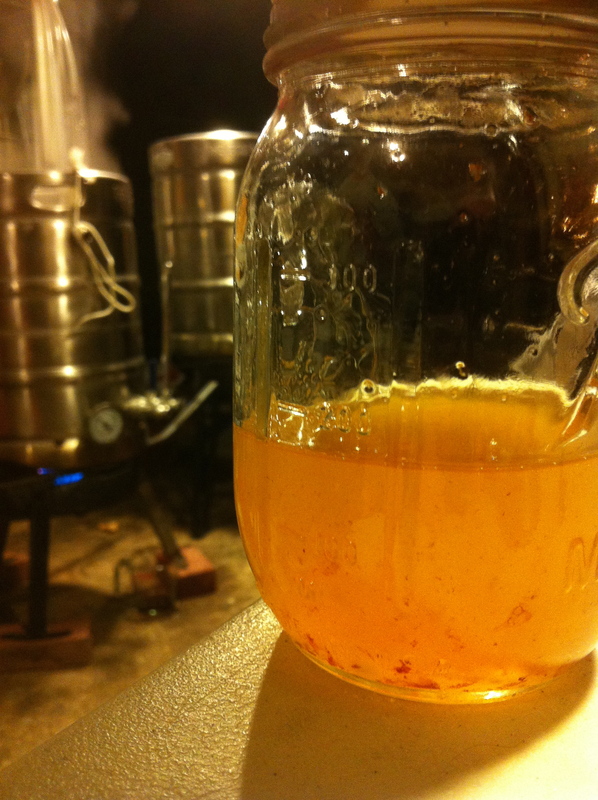 In order to get around the beer killer problems, I lagered my beer before I fermented it. Taking out the beer from under the grease that had solidified on top, then fermented it as normal. Wondering how this came out? I was going to try this technique with half of a maple wheat weizenbock I’ve made in the past. My theory was to cook off the bacon, and add both the cooked bacon and grease to the end of the boil and then doing the pre-lager technique to remove the fat. This came out great, but I’m going to up the bacon grease to 2-3c from 1. But the lager technique is critical to get rid of the oils.